Published: Nov. 19, 2014 at 01:30 p.m. 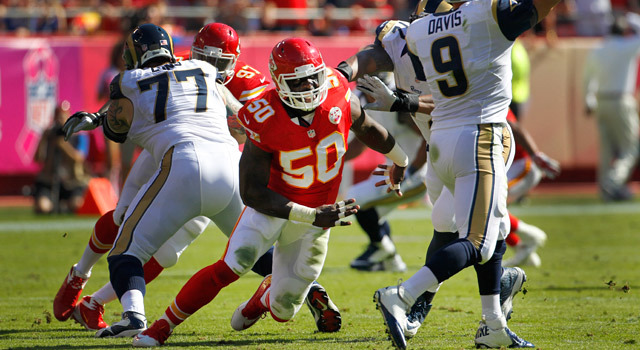 Updated: Nov. 19, 2014 at 04:43 p.m.
Kansas City Chiefs pass-rushing dynamo Justin Houston is on pace to finish the 2014 campaign with 19 sacks. With the 2014 NFL season heating up, the offseason and free agency seem farther away than ever. But many of the decisions made next spring will be based on what's happening on the football field now. Below you'll find a list of five players with a chance to reach free agency in 2015 who should definitely be retained by their teams -- along with four players who should be allowed to hit the market if they won't sign for the right price. Note: The players who should be kept are listed according to their relative importance; the players who can be let go are listed according to how readily they should be allowed to walk. The 25-year-old Houston brings a toughness and a skill set to the Chiefs' top-ranked pass defense that's hard to replace. He's recorded 38.5 sacks since entering the league in 2011, including an NFL-best 12 this season -- and that's despite playing on the left side, where it's usually tougher to get to the quarterback. The thing that's so good about him is that he can rush the passer and make plays in space. He's probably playing as well as he's ever played, collecting 41 tackles while helping to carry the load for a unit that's been without linebacker Derrick Johnson since early September. You just don't find guys like him every day. Suh is putting together the most complete season of his career. The fifth-year pro still makes the splash plays he's always made, but no longer does he take snaps off in between; now he's playing with consistent effort. When you combine his penchant for the stupendous with a more mature approach, you have an honest-to-goodness big-time player. Suh has contributed 4.5 sacks -- a pretty good total for a tackle -- and 28 tackles to the NFL's best defense. Signs might be pointing to his eventual departure, but the Lions should do whatever they can to keep him; he's just that important. The 26-year-old Thomas, who can catch passes and block, is a matchup nightmare for opposing defenses, someone to whom Peyton Manning regularly turns in tight situations -- after all, he already has 12 touchdown catches this season. And he still has room to get better, given that he didn't play much football at Portland State, where he was also a basketball star, or during his first two seasons in the NFL. I've slotted him ahead of the receivers on my list because I think it's harder to find a tight end like Thomas than it is to find a top-flight wideout. The Broncos should do what they can to re-sign both Julius and Demaryius Thomas, but if they have to choose one, I'd give the edge to Julius. Just compare the team's depth at receiver (Emmanuel Sanders) to that at the tight end position (Virgil Green, Jacob Tamme). Bryant looks like a man among boys when he's squaring off with defensive backs. He has good body structure, great strength and huge hands, and he's hustling more than he ever has before; this is probably his most consistent campaign as a pro. He wins the 50-50 ball about 75 percent of the time. It might be tempting to let Bryant walk and replace him with younger, less costly talent, especially given the success rate of the most recent crop of rookie receivers. But I'd caution that this group of newbies could be an anomaly, potentially a once-in-a-lifetime type of class, as first-year receivers typically do not come in and knock you out right away. There are years when the best rookie receiver doesn't catch more than 55 passes. This guy is really interesting. Maclin missed all of 2013 with a torn ACL, and I always worry about receivers coming off ACL injuries. 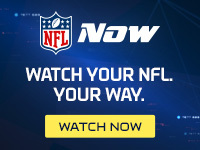 But he had enough confidence in his own ability to sign a one-year deal with the Eagles, and it's paying off: The sixth-year pro is on pace for 1,474 yards and 14 touchdown catches, which would easily be career highs. As much as I like rookie receiver Jordan Matthews, and as much as some folks seem to feel coach Chip Kelly can just plug any player into his system in Philly and thrive, I think the Eagles need Maclin. He's always a threat to make the big play and blow a game open. Also considered: Demaryius Thomas, WR, Denver Broncos; Randall Cobb, WR, Green Bay Packers; Chris Harris, CB, Denver Broncos. I'm guessing Crabtree will be looking for No. 1 receiver money -- but he is not a No. 1 receiver. He's averaging 11.8 yards per catch and just doesn't look fast enough. He's not making plays -- through Week 9, his longest play had been for 32 yards -- and he's dropping a lot of passes. He'd be a good No. 3, but he's not going to go for that type of price. I think the feeling around Cleveland is one of surprise at how well the Browns have done this season. The question is, would they be in the same spot with rookie Johnny Manziel starting instead of Hoyer? I'd say yes; among other factors, Cleveland's success can likely largely be attributed to a plus-8 turnover differential. Hoyer is 9-4 in 13 career starts with the Browns, but he's also thrown just 16 touchdown passes against eight interceptions, which is not mind-bogglingly great. So why give Hoyer a big raise to keep him around -- as the cream of the free-agent quarterback crop, there's a good chance he'll attract some healthy offers -- when the Browns would be no worse off starting Manziel? I don't know if it's the back surgery he had in 2013 or what, but Pierre-Paul just hasn't returned to the heights he reached in 2011, when he had 16.5 sacks. Since then, he's accumulated 12 total sacks, including just 3.5 this season, despite playing on the blind side of most opposing quarterbacks. In fact, for some reason, he's become a better player against the run than he is against the pass. That said, defensive linemen are hard to find -- as the Giants, who don't have much behind Pierre-Paul, can attest -- and he is still young (25). Depending on New York's cap situation, I'm guessing the Giants will try to bring him back. But there's a good chance they'll have to overpay to do so, given that everyone's desperate for a pass rusher, and I doubt whether they'd end up getting their money's worth. Sometimes, a team is better off starting over with a rookie and getting 4.5 sacks for $600,000 a year. Murray is having the season of a lifetime, rushing for a league-high 1,233 yards at a pace that will put him within spitting distance of 2,000. It's worth noting that after giving him an average of 27 carries per game over the first seven weeks this season, Dallas has lightened the load a bit, handing him the rock just 19 times in each of the past three games. The Cowboys should definitely try to bring him back in 2015 -- so what is he doing on this part of the list? That should only happen if they can get him for no more than three years. Murray is still just 26, but you always worry about the big picture with running backs, who get banged up and tend to lose their quickness over time. I would not sign Murray to a long-term deal, though I'm guessing he'll demand one -- which is why he falls here.